Radio-frequency identification (RFID) technology enhances and revolutionize the way the companies do business by improving efficiency of operations, improving asset traceability and visibility, deceasing pressure on manual processes, reducing costs and improving reliability. RFID tags are small in size and they require very less power and don’t need a battery to store and exchange information or data with readers. This makes it cheap and easy to apply tags to all kind of objects that people would like to track or identify. The increase in use of RFID technology in retail sector has been identified as one of the key driving factors for the U.S. RFID Tags Market. In 2016, the U.S. RFID Tags market was valued at US$809.4 mn and is expected to reach US$1,672.5 mn by 2025, expanding at a CAGR of 8.5% during the forecast period. Though already installed base of barcode systems may act as a restrain for RFID tags market. Nonetheless, the increasing focus on enhancing security system has provided opportunity for the usage of RFID chips in passports and visas. 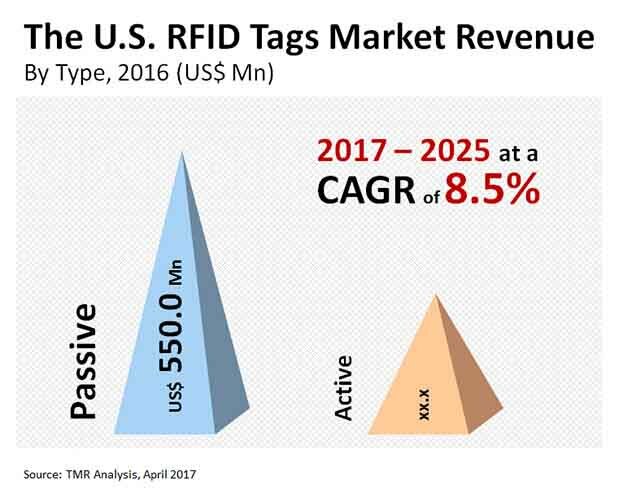 Based on type of tags, the U.S. RFID Tags market has been segmented into active and passive tags segments. The passive tags segment held the largest market share in 2016 of the total market revenue share. The passive tag segment is expected to increase at a CAGR of 8.9% during the forecast period from 2017 to 2025. On the other hand, active tags segment is projected to grow significantly throughout the forecast period mainly in surveillance and security sector. These tags are used for tracking containers and pallets as well as large military assets. These tags are also used in tracking ocean containers and land, vehicles, logistics and other high and large value assets. Based on product type, the U.S. RFID tags market is segmented into healthcare tags, commercial tags, correctional tags and others. In 2016, the largest market share of is accumulated by commercial tags segment and is expected to rise at a CAGR of 8.9% during the forecast period. Healthcare tags are also estimated to support the growth of the RFID tags market. These tags are mainly used for medical devices tracking purpose. Proactive initiative of healthcare RFID tags implementation for managing medical device threat, streamlining processes, automating billing and reporting has been beneficial to hospitals. In terms of end-user industry, the market has been classified into healthcare, retail, automotive, logistics and transportation, surveillance and security and others such as sports, wildlife, livestock, and IT amongst others. In 2016, the largest market share is accumulated by logistics and transportation industry and is expected to grow considerably during the forecast period. In this sector, RFID-based technologies are extensively implemented to improve transportation security and safety, thus increasing the efficiency of the transportation system and improving the way of living of the citizens. In 2025, the logistics and transportation segment is projected to dominate the market revenue share followed by retail and healthcare sector. Some of the leading players operating in the U.S. RFID tags market are AMS AG, Atmel Corporation, Impinj Inc., Alien Technology, Confidex LTD., HID USA Corporation, Invengo Information Technology Co., Ltd., Omni- ID Ltd., NXP Semiconductors N.V., and RF Code Inc.
Radio frequency identification (RFID) tags are the electronic tags that functions on the principle of radio waves. RFID tags are primarily used to monitor and track objects using RFID reader. The information recorded by RFID tag can be read by scanning devices through RFID technology. RFID tags market report provides analysis for the period 2015-2025, wherein the period from 2017 to 2025 is the forecast period and 2016 is the base year. The report covers all the major trends and technologies playing influential role in the RFID tags market’s growth over the forecast period. The study provides a complete perspective on the U.S RFID tags market in terms of revenue (in US$ Mn and Mn Units). The market overview of the report demonstrates the market dynamics such as drivers, restraints, and opportunities that influence the current nature and future status of RFID tags market in the U.S. along with the key indicators and trends. The report also provides a market attractive analysis for every segment in order to provide in-depth understanding of the overall scenario of RFID tags market in the U.S. The U.S. RFID tags market is segmented on the basis of type, product type and end-use industry. The type segment includes active and passive RFID tags. The basis of differentiation of active and passive RFID tags is power source. Active RFID tags are battery powered, whereas, passive RFID tags do not have an internal power source. On the basis of product type, RFID tags market is segmented into healthcare tags, commercial tags, correctional tags and others. Healthcare tags are used to track medicines, patient management, and medical staff management among others. With increasing requirement for inventory management, commercial tags are expected to view an increase in demand during the forecast period. The tags used to monitor inmates, security control and access management are generally termed as correctional tags. The factors that impact adoption of healthcare tags, commercial tags and correctional tags are identified in the report. On the basis of end-use industry, the RFID tags market is segmented as healthcare, retail, automotive, logistics and transportation, surveillance and security and others (consisting of sports, wildlife, livestock and IT). Furthermore, the report analyzes the impact, market trends and opportunities of the U.S. RFID tags market for the forecast period 2017-2025. The report also covers the RFID tags segment trends in the U.S, market opportunities, strategies adopted by market players that are leading to the growth in adoption of RFID tags. Reasons for the growth and adoption of various segments are also included in the report. The RFID tags market report also covers the market share analysis of the key players engaged in RFID tags market of the U.S. The essential information pertaining to segment growth, segment trends are also analyzed in the report. Furthermore, the segment analysis explains the factors which are currently affecting the RFID tags market in the U.S. This report also provides the ecosystem analysis for the RFID tags market which explains the participants of the value chain. The RFID tags market in the U.S. is viewing aggressive competition. In addition to this major mergers, acquisitions and partnerships by market players are highlighted in the U.S. RFID tags market report. Major business strategies adopted by key players, SWOT analysis, business overview and product offerings have also been identified in the research report. The key highlight of the report, includes revenue and volume of key market players on the basis of active and passive segment in terms of U.S$ Mn and thousand units. The prominent service providers engaged in the U.S. RFID Tags market include AMS AG, Atmel Corporation, Impinj Inc., Alien Technology, Confidex LTD., HID USA Corporation, Invengo Information Technology Co., Ltd., NXP Semiconductors N.V., Omni- ID Ltd. and RF Code Inc.